Deputy Matt Ross is investigating a single vehicle accident Tuesday afternoon in which the auto caught fire after colliding with culvert in a ditch at Firebrick. Ross said the accident happened about 4:45 p.m. when a Pontiac G6, operated by Zane Frye-Scott, was traveling west on Ky. Rt. 8 at Firebrick. Ross said Frye-Scott, 16, of Portsmouth, Ohio, reported the right front wheel went off the right side of the roadway and when he steered left the auto crossed the roadway, went into the ditch and struck a culvert. The auto caught fire in the engine compartment. 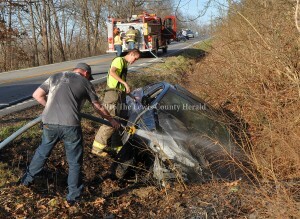 Frye-Scott and a passenger were able to safely exit the auto and were not injured in the accident. Firebrick Fire and Rescue responded to the scene and extinguished the fire. Traffic on the roadway was disrupted for a short time until the scene was cleared. Ross was assisted at the scene by Deputy Gary Erwin.